Strawberry is so cute looking and taste like heaven. I want to have some of them everyday, but not possible since they are a bit expensive, really can't afford it everyday. 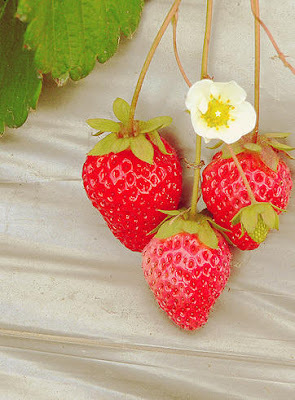 I wonder if I can plant them in my garden, I told my mum about this, but it turns out to be a joke, because it's not a city to grow strawberries here. I would not rattle about their huge benifets here, everybody know it. Strawberry even got some magic functions as to fight cancer DNA according to some sayings. They are so delicate, strawberries squash easily. So everytime I bought them, be most careful. Remember Strawberry cannot be frozen. It's better to eat the fresh ones, enjoy every sake of it.